Good morning! If you’ve not swung by this blog before, firstly ‘hello!’ Secondly, you might like to take a look at my previous posts about my month long #cyclefitchallange with James from High Rise Coaching so that the following can be read in context. In my previous posts you can find out more about my motivation for doing this, how we’ve prepared and read a short explanation of heart rate zone training for cycling. Follow me for the next month as I try to stick with a training plan, something I’ve never had the willpower, discipline or simply desire to do before! Day#1 of my month long bid to get fit and fast on the bike began a little strangely – with an easy hour-long recovery ride. As I’d done an FTP test the day before to figure out my heart rate zones, I was instructed to go for a really gentle ride as ‘active recovery has been shown to be more effective than just simple rest in some cases.’ So far, so easy. Day#2 was the first prescribed session for me to undertake, so I was really excited about getting cracking. James had promised he wouldn’t set me anything to do on the turbo trainer as he knows how much I hate it, and besides, it’s summer and I live near a brilliant closed road cycling circuit – Torbay Velopark. In preparation for my workout, I’d programmed my training zones into my Garmin so that the display showed me how long I’d been riding, my heart rate and my exact heart rate zone – not just Zone 1, Zone 2, Zone 3, but broken into increments of a zone, for instance Zone 2.3, Zone 2.3, Zone 2.4. 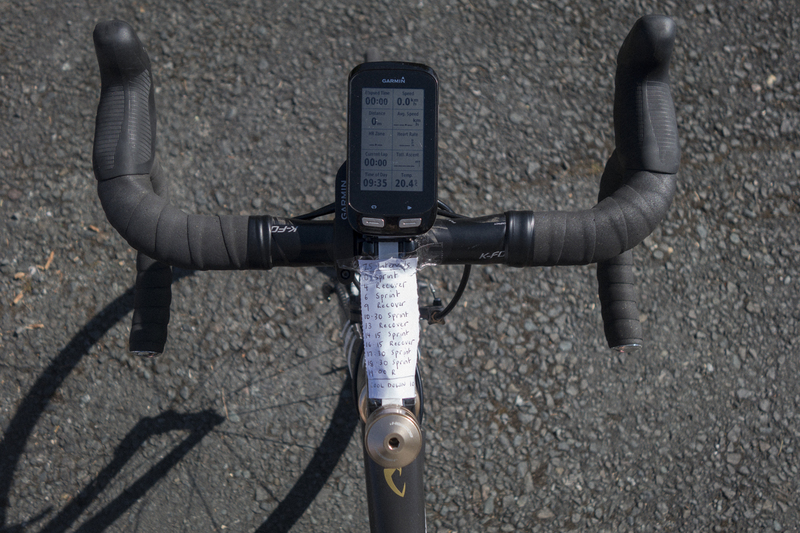 I’d also written out what I was to do and taped it to my stem, so the timings of my efforts were clear to read. I headed to the Velopark, warming up on the way to the circuit as I passed the brightly coloured beach huts and seagulls dive-bombing unsuspecting holidaymakers and trying to steal their chips. I couldn’t wait to begin; it was such a lovely day and I was feeling fantastic about what I was trying to achieve, and excited about the process. “I found it really hard to get over zone 4.3. The max I got to was zone 4.5 because my legs hurt SO much I couldn’t push harder. It was my legs that were stopping me, rather than my breathing. It was super hard to complete the 12, 10 and 8 minute efforts, but I did stay in the right zone throughout, even though it was at the lower end of zone 4. Felt really hard, but I did it! Day#3 was a rest day, and I kind of found this harder than the training day. During our initial phone call ahead of starting the challenge, James had impressed upon me the importance of rest and recovery, telling me that it’s one of the most crucial things to schedule in and often the first thing people neglect. But even knowing that, it just felt wrong not to ride, and I really wanted to because I love cycling! But I have decided that for just one month I’m actually going to do what I’m told, so I didn’t get on the bike. Day#4 I was set a bodyweight training circuit to be done off the bike, the aim being to build strength and power, core stability and that kind of thing. Again, I found it nearly impossible not to go and smash out a ride, and quite apart from the fact I love riding, I started worrying that I was getting less fit through all the time off the bike (two days). I scan read the bodyweight circuit without paying much attention and it seemed easy enough, so we went out for a cream tea with huge scones then I nipped back to do it before we went for beers on the beach. How wrong I’d been to think it was easy – turns out that I’ve somehow adapted to cycling at the expense of more general strength and all round fitness, and I was literally howling whilst wobbling around trying to hold plank after plank. It was pretty hilarious really – I had to complete the circuit three times and even the first one required a lot of teeth gritting! But like the other instructions I’d obeyed. I didn’t deviate from what was prescribed and I damn well did it. Anything that feels that horrid has got to be good for you, right?